Concrete slabs are used to support everything from patio furniture, to foot traffic, to semi-trailer trucks. With such a wide range of purposes and support requirements, concrete slabs present many construction variables that must be considered before concrete placement begins. A slab pour requires efficient planning so that all of the elements that go into producing a high-quality slab are done in time (before the concrete sets) and done correctly. Knowing the right finishing tools to use and the right time to start bull floating and final troweling are essential to preventing dusting, scaling and craze cracking of the slab. 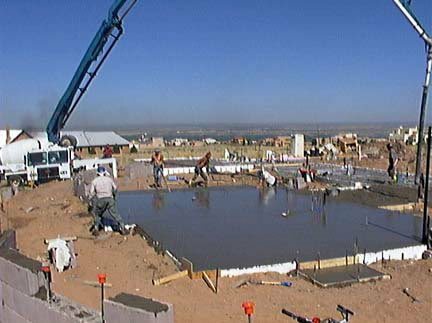 You also need to provide a firm and stable base for the concrete slab by compacting the subgrade properly. Neglecting this critical step can result in serious slab settlement and cracking problems, especially in slabs placed on poor subsoil or exposed to heavy traffic conditions. Determining the right concrete mix design and reinforcement requirements for the anticipated slab exposure and traffic conditions is essential as well. You’ll need to calculate the proper water-cement ratio and air-entrainment requirements for the concrete mix to ensure that the slab will perform as intended. Proper positioning and support of wire reinforcement is also important to control and minimize cracking. After concrete placement, you have a whole new set of issues to address, such as proper placement and spacing of control joints and adequate curing. The timing and execution of these post-pour activities are equally essential to good slab performance, since rapid drying of a slab and improper installation of control joints can lead to inadequate strength and unwanted cracking. Concrete that is moist cured for at least seven days is about 50% stronger than uncured concrete. The information in this section will guide you through the steps required to build high-quality concrete slabs on grade and help you avoid mistakes that can lead to poor performance, or even worse, slab failure. You’ll also find advice on concrete mix design and calculating the water-cement ratio.